We are obsessed with the very interesting problem of how to spur momentum in a world of seismic change. Tried or proven or best practices just won’t do it anymore. Nor will canned answers. Our unorthodox solutions are fueled by inventive thinking, insatiable curiosity, and scientific methods. In this world of complexity, we believe each person, each organization, and each situation we encounter to be unique – and so is every solution we create. Helping great people solve complex problems interfering with their ability to grow is the most fulfilling work we know. That is why in 2011 we came together to create Department26. Miki developed and honed her combustible mix of business and creative acumen working with a top product innovation firm before joining a design agency and building out a sought-after strategy practice for leading brands. 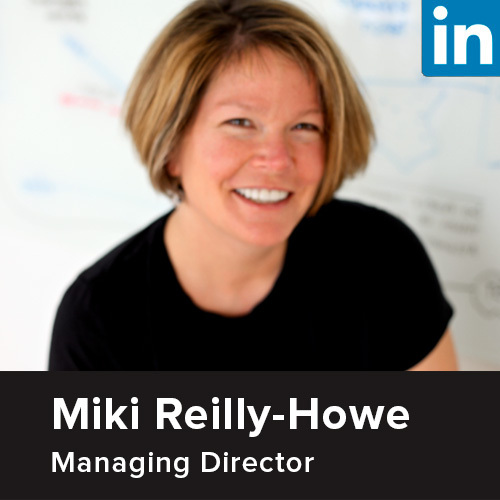 As co-founder of Department26, Miki is a valued business partner to senior executives, earning a reputation for incisively cutting through organizational complexity and overcoming obstacles to streamline transformation efforts. Throughout her 25-year career she has cultivated a remarkable ability to see the larger picture, discover the truth, and act as a catalyst for solutions. Warren brings expertise in behavioral and applied economics and creative industry technique to Department26 client encounters. His wide practice lens and ongoing cross-disciplinary learning provides radical insights and agile thinking for highly complex and uncertain strategy environments. Since co-founding Department26 he has worked with senior executives in technology, health, CPG, and financial services to help transform organizations from the inside out.